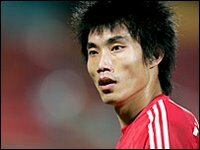 Probably the biggest football star in China will join up with the Charlton squad next week to spend the rest of the season on loan. Zheng Zhi is 26 and plays primarily as a defensive midfielder. Judging by reports he has the passionate qualities we have been desperate for, he got banned for 6 games in September 2005 when he spat and attacked a referee in a match against Malaysia. Amdy Faye he is not. Although unjustifiably he got criticised for breaking Djibril Cissé leg in a world cup warm up match earlier this year but the challenge probably didn't even warrant a free-kick. Lets hope ZZ is a valuable help in our attempt to stay up and not just another Karim Bagheri, who I remember was dubbed Iran's Zidane. Meanwhile according to reports Steven Pressley will be announced to the media as a Celtic player later this afternoon. I guess Champions League football is slightly more attractive than the Championship, but it's a shame because he is just the sort of player that Addick fans' want to see in a red shirt.